If you’re one of millions of people that don’t have access to family financial support, there are a range of Government Schemes to help you take your first step on the ladder and we outline the key points below. Then we look at the Joint Equity Shared Home Ownership scheme for comparison. Well we would wouldn’t we! First-time buyers can open a Help to Buy ISA, which gives a 25% government bonus on amounts saved between £1,600 and £12,000 – although the bonus is capped at £3,000. It can be used for any property costing under £250,000 (£450,000 in London) and any mortgage. You can save up to £1,000 in your first month, then up to £200 a month after that. You can choose to pay in less if you want, and it’ll still work. Help to buy ISAs are only available to individuals. If you’re buying together, you can separately claim the government bonuses on your savings – and then combine the two to form a joint deposit. The deadline to open an account is December 2019. In April 2017, help to buy will relaunch to become the government’s lifetime ISA . But you will be able to shift your money across tax-free. It’s a monthly saving scheme but if you miss a contribution one month, you can’t make up for it in the following month (the cap is £200). If you’re buying together, but one of you is already a home owner. The first time buyer can still open an account. You need to get your solicitor to apply for the bonus when you buy a home. Alternatively, you can take the money out at any point, but if you choose this, you won’t qualify for the bonus. 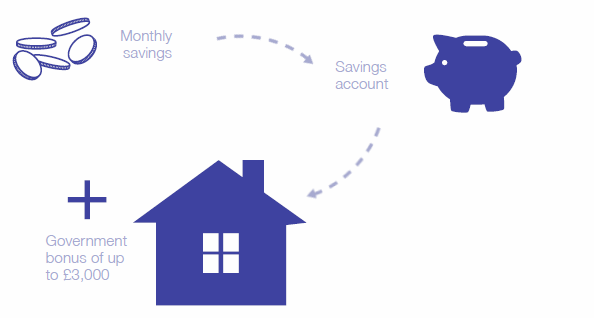 If you’re saving into a help to buy ISA you can’t save into another cash ISA in the same tax year. The remaining part of help to buy scheme is called the Equity Loan. It requires a minimum 5% deposit of the property value with the government offering an interest-free loan of a further 20%. The remaining 75% is covered by a standard mortgage. 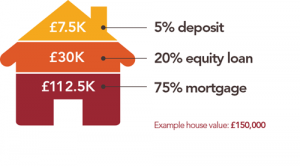 As Zoopla explains, to buy a £200,000 property under the equity loan scheme, you’d need a minimum deposit of £10,000 and to qualify for a £150,000 mortgage. The government then provides an equity loan of £40,000. There is no interest to pay for the first 5 years. In year 6, interest (known as a ‘loan fee’) kicks in at 1.75%. The rate increases every year thereafter at the RPI (retail prices index) measure of inflation plus 1%. The idea with the help to buy equity loan is that, because you’re theoretically only borrowing 75% from the mortgage lender, rates will be cheaper than on a 95% mortgage. But don’t assume that’s always the case. When you come to sell your home, the government will take back its 20% share of the sale price. This option is only available on new-build properties worth up to £600,000. The scheme will remain open until 2020. In his 2016 Budget, Philip Hammond announced a new lifetime ISA which will launch in April 2017. This will replace the current help to buy ISA – you’ll be able to shift your money across tax-free. The account offers a tax-free boost of up to £1,000 a year towards either buying your first home or saving towards retirement. Savers aged 40 or under can open these accounts, which will become available from April 2017. You can put away up to £4,000 each year. The government will then boost returns by 25p for every £1 saved at the end of each tax year. If you’re a first time buyer, you can then opt to use your lifetime ISA cash as a deposit on a property worth up to £450,000. Finally the penalty – if you save £1,000 the Government will give you £250 seems a good deal (but remember the maximum you can get is £1,000 bonus a year not to be sniffed at but not its not huge sums) and if you need the cash for any other purpose than buying a home you have to pay a penalty of 25%. But here is the rub its calculated on 25% of the total which is £1,250 and so the penalty is £312.50 leaving you just £937.50 or £62.50 less than you saved. That is the penalty you pay. In March 2015, the government proposed a new Starter Homes Initiative. In January this year, it said work on the new scheme had commenced. This will see the creation of around 200,000 new ‘affordable’ homes, sold at a minimum discount of 20% to first-time home buyers aged between 23 and 40. Construction of these homes started in January 2017 – and the properties could be ready to sell as early as January next year. There’s a £250,000 price cap on homes available under the scheme, rising to £450,000 if you’re buying in London. Beware though developers build homes to make money so expect low specifications, small sizes ad corners to be cut. Shared Ownership schemes allow you to purchase just share of a home (between 25% and 75%) from a local Housing Association and pay rent – up to 3% – on the part you don’t own. Under a process known as ‘staircasing’ you’ll then be given the chance to buy back chunks as and when you can afford to until you own 100% of the home. These chunks will be priced at the home’s current market value as assessed by the Housing Association. You will also have to pay a valuer’s fee each time. To qualify for Shared Ownership, your household income must not exceed £80,000 or £90,000 if you’re buying in London. Housing Associations have strict rules and eligibility can be a problem if you do not have enough “need” as they define it. The application process is tortuous at best and you can only buy the properties they have on offer in the locations they have built in. So how does Joint Equity Shared Home Ownership compare? As you know the Resident Partner buys 50% of the home and Joint Equity contributes the other 50%. It’s a simple to understand scheme based on real Partnership between the Resident Partner and the Investment Partner. You can use your Help to Buy or Lifetime ISA to buy your Share as long as you have a mortgage as well. You cannot staircase above 50% but you can offer to buy out the Investment Partner 50%. If you sell your Share the Investment Partner may buy it from you and the gain you make is all yours. You pay a Non Resident Partner payment for the 50% you do not own, the same as the Housing Association rent, but with Joint Equity its not a rent and there are no rental conditions attached. 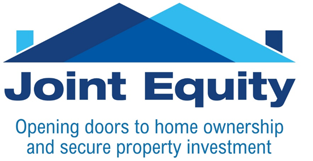 Joint Equity does build homes for sale in the Joint Equity Shared Home Ownership scheme but because we are 50% Partners with the Resident Partner we build real homes for people to live in, to high specifications, with large airy rooms. We build for the future value of our Share not for the sale price today and walk away from the future value like developers and builders. Finally we are your Partners as long as you stay with Joint Equity and we are always here when you need help and advice with anything to do with your home, we will also contribute to improvements that raise the value of your home. So Joint Equity is simple, easy to live with and a real Partnership and that makes living in your own home with our help rewarding, profitable and secure. Some of our Partners have been with us over 10 years now and say they never want to leave.